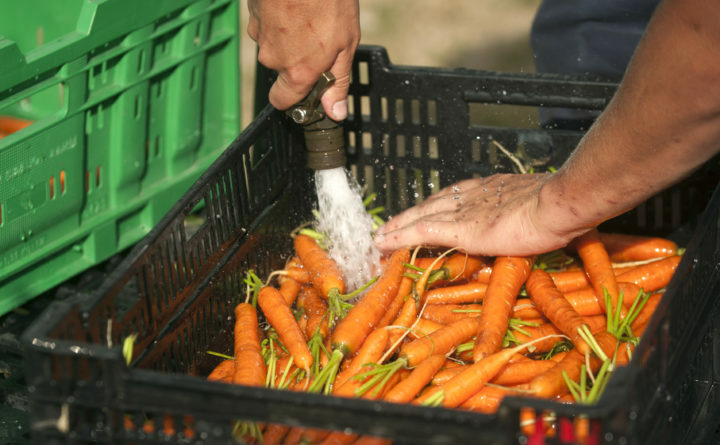 Tom Wolf a farm apprentice from New Orleans, Louisiana washes carrots at the Four Season Farm in Brooksville. 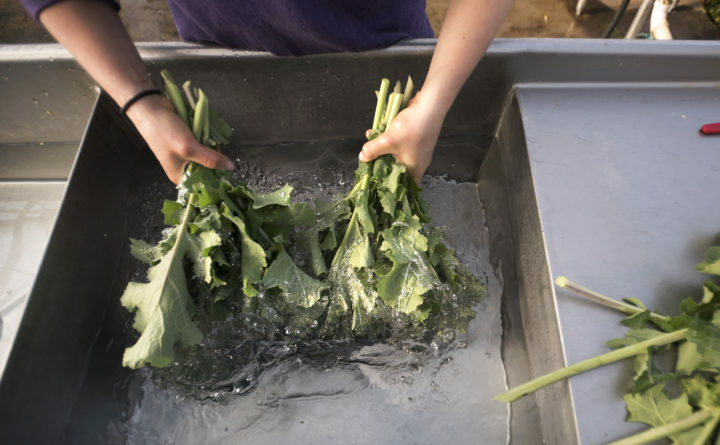 Rose Zoller washes kale harvested that morning in the main high-tunnel hoop house on Tuesday at Four Season Farm in Brooksville, Jan. 17, 2017. The first killing frosts have come and gone, and Mainers have rummaged to find winter clothing, thought about putting snow tires on cars, and dug out the slow cooker for all those cozy cold-weather meals. It’s a busy time of year, but one thing Mainers may not have to put at the top of their to-do lists is cleaning out their gardens of all the cold-weather vegetables that have happily been growing even as the days get shorter and the temperatures drop. David Wessels, the coordinator for the Troy Howard Middle School Garden Project in Belfast, said that he and his students are in no rush to get all their root vegetables and other cold-happy crops harvested. Not all plants can take a frosty night, of course. Tender, or frost-sensitive crops, such as onions, garlic, tomatoes and beans all should be out of the garden by now. Squash and pumpkins also do not like being frozen, according to Christa Bahner of Bahner Farm, and should be brought inside. But with cold-hardier vegetables including carrots, leeks, kale, parsnips and more, a little frost won’t hurt them. “I think that in general, a lot of things are more frost-tolerant than people think they are,” Bahner said. These root vegetables don’t mind the cold. In fact, a little frost makes them taste better. That’s why some years Wessels and his students have covered their carrots with a heavy layer of leaf mulch and left them in the ground into the winter. Some farmers lay row cover fabric over their carrots if the weather is expected to get particularly cold, Bahner said. She doesn’t worry about 20 degree Fahrenheit nights with her carrots, she said, although at the farm, they try to get them out of the ground by the end of October or sometimes November. “Freezing is not going to kill your carrots, as long as it doesn’t freeze too hard,” she said. As for parsnips, go ahead and leave them in the ground, Bahner said. Leeks, that staple of autumn soups, are extremely cold hardy. They can stay in your garden for a while, according to the farmers. “They do not mind freezing, as long as they have a chance to thaw out again,” Bahner said. Wessels agreed. He has overwintered his leeks “many times,” and said they can even be harvested and used as late as the early spring, before they start flowering. Still, if it gets very cold, sometimes the outer layers on the leeks will be harmed. Bahner approaches beets similarly to the way she treats carrots. She tries to get them out of the fields by the end of October, because they can be stored very well in a refrigerator or cooler. “We have a 35 degree [Fahrenheit] cooler and we can keep them forever,” she said. Cole crops is a term used to describe several vegetables in the mustard family, including kale, Brussel sprout, turnip, cabbage and kohlrabi. These vegetables have a reputation for being cold-hardy, and they live up to their billing, the farmers said. Storage cabbage can remain in the garden until November, Bahner said, and Brussels sprouts also don’t mind freezing temperatures. She does try to harvest her sprouts by the end of October and get her turnips harvested in November.